We all love a scratch-free car. Especially if we buy it new, we would love it to stay shiny and clean forever. Unfortunately, that shine we all love will not last. In fact, even if you never scratch it, the shine will simply go away thanks to UV radiation which slowly damages the clear coat. It is almost impossible to protect your car from scratches and dents. The bottom line is that you own your vehicle for your convenience, and as months turn into years you lose that initial respect for your car. Before you know it, every single panel of your car has at least one scratch or dent. 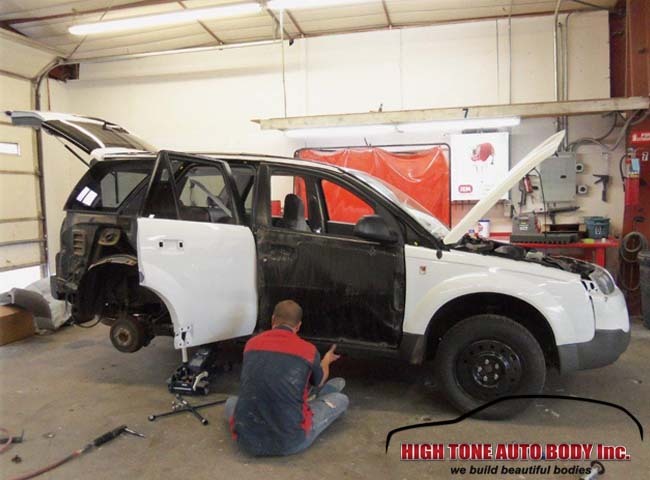 This is what happened with this white Saturn VUE. The owner was a family person, she had kids, dog, did regular trips to camps and slowly but surely her Saturn slowly lost its charm. She took her vehicle in for a face-lift. This meant that we needed to work on every single panel, and some of them were quite badly damaged from those unavoidable supermarket parking lot door-to-door encounters. To do a thorough job, we removed all the panels that needed some body work. After smoothing out the metal and plastic panels, it was time for make-up. Disassembly of all right side panels to be repaired and replaced. Applying sealer to the hood and other panels that were damaged. Our certified paint technician adds a coat of sealer to all panels for corrosion protection. Urethane sealed panels awaiting base coat application. 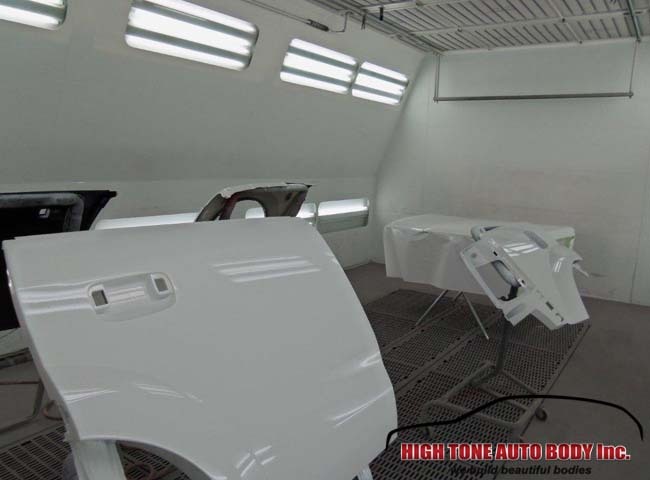 Once the base coat was dry, the paint technician added two coats of clear coat that serves as a protective layer that keeps the white base paint from scratches and harmful UV rays. 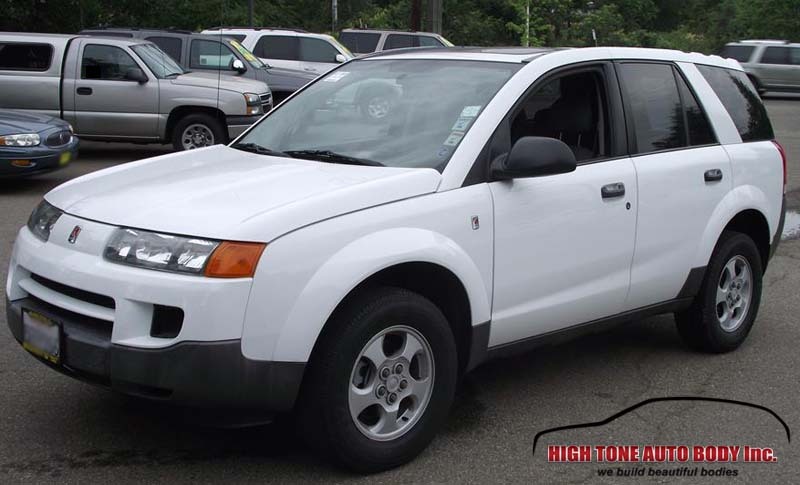 Saturn Vue panels, painted clear-coated, baked and ready for installment. 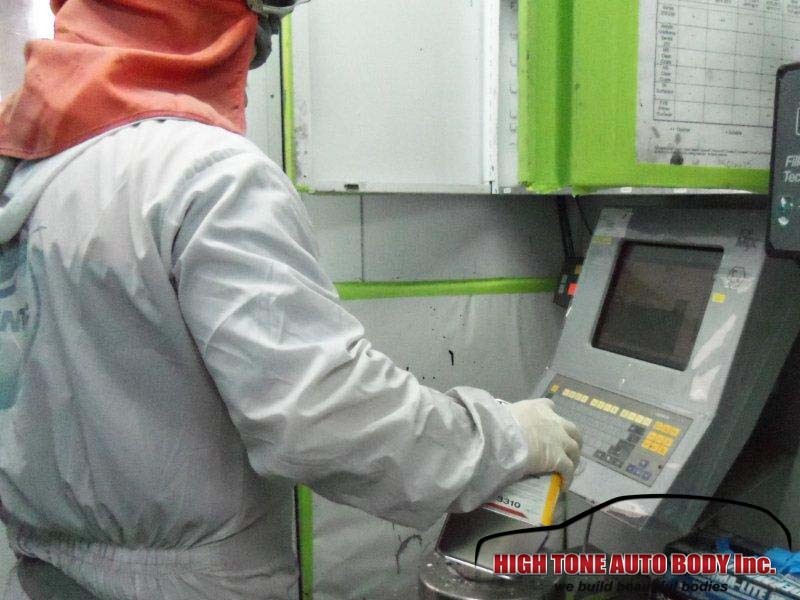 Thanks to the qualified technicians and the clear coat, the car panels got their like-new sparkly shine. Headlamp polish/restoration if your headlamps are fading and it is difficult to see. Wash and wax the exterior of the vehicle to protect the paint of your vehicle. Aquapel application to your windshield to help improve winter driving visibility. Clear bra application to help protect your vehicles paint job. Polished headlamps will significantly increase the light intensity and provide you with a safe driving experience. Among the most influential safety factors during winter is having visibility. Increasing visibility will help you see the road situation and react faster and safer in terms of breaking or avoiding collision. Headlights fade and lose luminosity because the protective plastic lens gets damaged and the transparency decreases. In fact, it is not glass but plastic that is not immune to the Ultra Violet (UV) radiation from the sun, temperature extremes, de-icers, sand and gravel put on the road. Driving up and down the Roaring Fork Valley on Highway 82, our vehicles are exposed to environmental factors as well as debris on the road. Washing the undercarriage of your vehicle is important to remove build up of ice, mud, rocks, salt and other debris. These items sometimes get caught in the nooks and crannies of bumpers, brackets, wheel wells and splash guards. When this build up of ice, mud, rocks and salt (Magnesium chloride) sit and stay moist they have a tendency to start the corrosion process on anything containing metal and aluminum. This is why it is so important to clean both the undercarriage as well as the exterior of your vehicle frequently throughout the winter season. 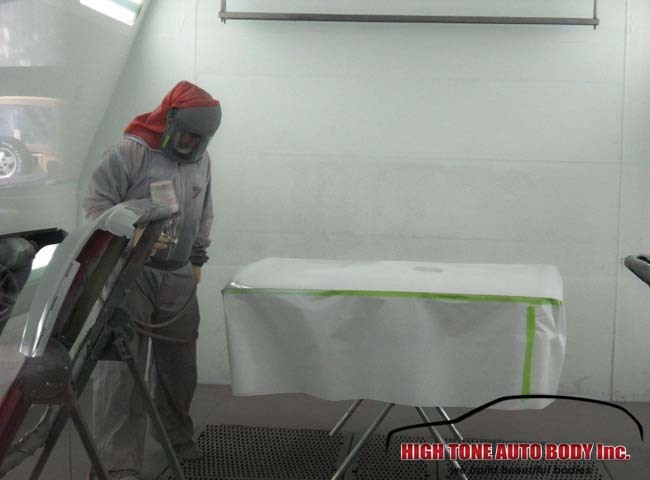 Having High Tone Auto Body apply a quality wax to your paint helps minimize the amount of time the corrosive mixture can stay on your paint and do damage. Wax all painted panels and get any body or paint repairs done before winter hits! The Aspen area is famous for heavy snowfalls and long winters. This means that for several months our vehicles are exposed to moisture that can result in paint peeling and rust. This is especially true if you keep your vehicle out side and it regularly gets plenty of snow on its roof. The roof of your vehicle is always exposed to the elements, and often times the paint peels and the metal is exposed. Given enough time, this exposed metal rusts and causes even more paint peeling. In order to prepare your vehicle for the winter, it is best to take the time and repair any paint cracking and peeling before the winter starts. When done on time, these repairs are only cosmetic and are therefore significantly cheaper than if rust appears and the repair turns into an auto body repair. Clear coat and paint peeling gradually grows from invisible specs to large chunks of paint falling off. Preventing this process is the smartest and cheapest way to go. The image above shows how the layers of clear coat and paint starting as invisible specs, and over time they grow in size and entire patches of paint will delaminate. 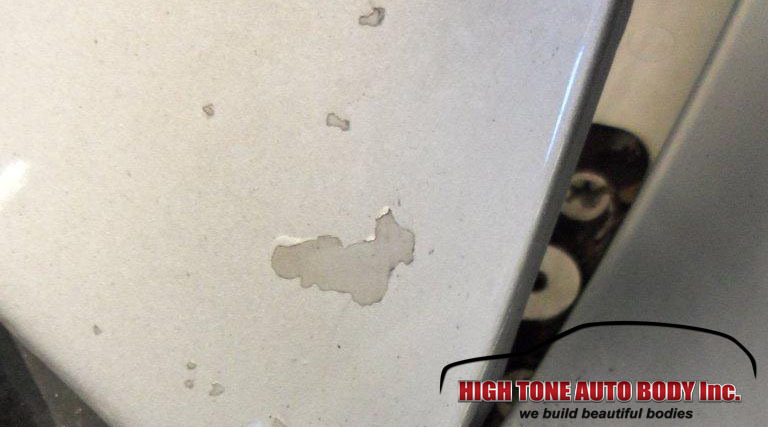 In order to avoid such defects, it is smart to visit High Tone Auto Body and fix any paint problems before winter comes. To find out how car paint damages appear, visit this page. Aquapel is a coating that can be applied to your windshield to help repel rain, sleet and snow. The water will bead up and race across the windshield out of your viewing area. It is also beneficial to get new wiper blades installed for the winter season. Clear your windshield free of ice and snow before using your wipers. This will help improve the longevity of your wiper blades. With snowfall our roads are regularly treated with sand and salt. During winter the roads really become littered with debris that causes significant paint damage and regularly plays an important role in windshield damage as well. After the snow melts, driving behind a truck becomes as annoying as flying through an asteroid field. Eventually your vehicle will become damaged from sand and rock chips. Bumpers made of steel can rust where rocks and other debris has impacted the painted or chrome bumper, while plastic bumper covers do not rust but they do chip and become pitted and will need to be repaired and repainted. Once the bumper is either replaced or repaired a clear bra installation will help prevent rusting and chipping of the paint. 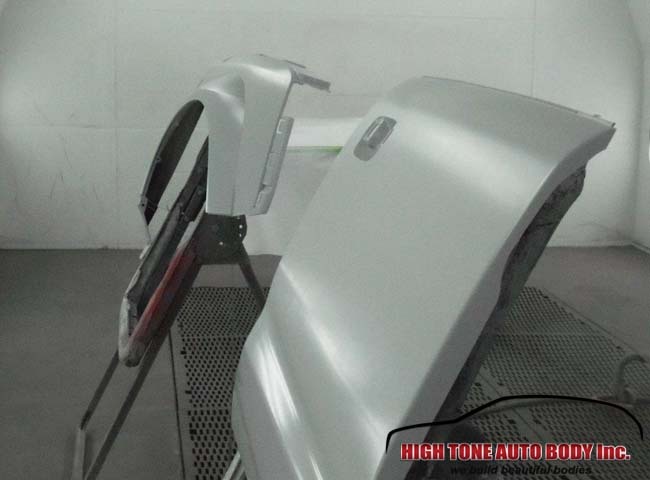 This is why it is very smart to invest in clear bra installation that will protect your vehicle hood, bumpers, fender tips, etc from rock chips. The cheapest and smartest way to protect your hood from paint damage and rust spots is to install a clear bra before winter. Proactively investing some time and money to install a clear bra will go a long way in protecting your vehicle. The image above shows how a detailed and proper clear bra installation is done. With such a protective layer, your car hood will be safe from rock chip damage. Get your car ready for winter today! Please don’t hesitate to call us to schedule your complimentary estimate at (970) 927-4351. Cities like Aspen, Basalt, Carbondale, Snowmass get cold winters with heavy snow. Cold weather and salt on our roads eat over the clear coat so the color coat is exposed and gets damaged over time. This is why regular waxing is required especially at the beginning of winter in order to protect your vehicle paint and prevent damage such as clear coat peeling from ever happening. UV rays cause the clear coat to dry out or become oxidized. Dry clear coat begins to flake and peel, showing white flaky areas where the coat is peeling. In most cases the base color paint is not damaged but to prevent further damage, you should get your vehicle in for clear coat repair as soon as you notice flaking. Why should you repair the clear coat as soon as possible? If the clear coat peels out and the paint layer is damaged, your vehicle will need a complete paint rework which is an expensive process. Fixing clear coat damage at an earlier stage will not only save your money but also time and frustration. Also, the clear coat offers added rust protection which makes clear coat not only a cosmetic but a structural part of your vehicle. DIY Clear Coat Repair or Professional Service? One danger here is that people opt for Do-It-Yourself Clear Coat Repair Packs and end up doing more harm than good. Repairing the clear coat is a precise technical process and only a skilled technician can perform a solid clear coat repair job. 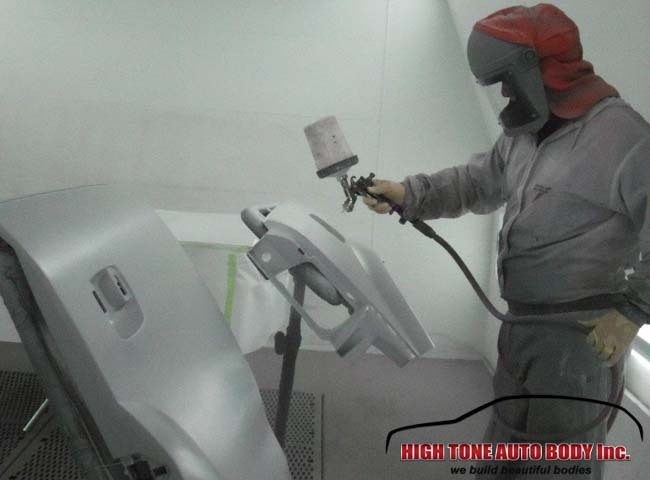 By bringing your damaged vehicle here at High Tone Auto Body you can rest assured that it will get a high-end auto bodywork and detailing with a satisfaction guaranteed. Our technicians will also give you key info you need to know about the clear coat and how to go about washing/waxing your vehicle after the clear coat repair.